Hey, guess what-- this isn't a book at all. I ordered it online, and had trouble finding a copy in "very good" or "like new" condition, and when it arrived from St. Paul's Episcopal Church in Walnut Creek, California, I found out why there are no "like new" copies of this book. It's a diary. With an awesome picture of a hip Judy Blume standing in front of a wind machine on the back. On the front cover of my copy, a kid has written: "My Potassium Diary." OK. Kid, if you're out there, please find me. Explain. The idea from this diary comes from my readers, who often say, I have no one to talk to-- no one to tell what I am really thinking and feeling. Sometimes, just writing down your feeling makes them easier to understand. 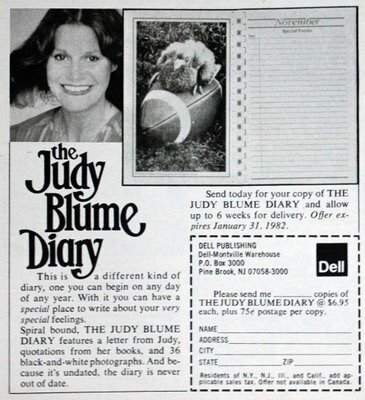 This diary came out in 1981, the same year as Tiger Eyes, and not long after Judy Blume and censorship became almost synonymous. You will find a quote from one of my books on every page of this diary, and each month there will be three photographs. These words and pictures may remind you of how you sometimes feel. You can write about that, or your family, or your friends, your happy times and your sad times. When I was a kid I kept all sorts of diaries. I mostly wrote about my friends. As I got older I tried to be more of a "writer," putting in flowery language and making what I considered to be deep observations. I still have a lot of diaries. I guess I'll just add this one to the collection. I love that Judy acknowledges the variety of feelings that kids have. All are valid to her, always. The petty jealousies of friends. Grief and pesky little brothers exisiting on the same page. By this time she was a brand. She was famous. Kids were reaching out to her. And she was reaching back. And yes, that's a picture of a turkey sitting on a football. I'm not quite sure what deep emotions I'm supposed to feel about that. Perhaps just delight.